Penn State senior Katie O’Donnell (Henderson) has been named the 2018 Big Ten Midfielder of the Year as announced by the league office earlier this week. O’Donnell becomes the fourth Penn State student-athlete to earn a major Big Ten Conference Award as the Nittany Lions have had at least one award winner for each of the first four seasons of Big Ten play. The senior joins Emi Smith ’16 (2015 Big Ten Goalkeeper of the Year), junior Madison Carter (2016 Big Ten Freshman of the Year) and Steph Lazo ’17 (2017 Big Ten Attack Player of the Year) as major award winners the past four seasons. Head Coach Missy Doherty was also named the inaugural Big Ten Coach of the Year in 2015. 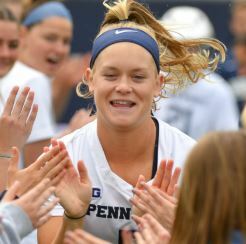 O’Donnell – the Phillylacrosse.com Co-Player of the Year in 2014 – finished her brilliant season with 61 goals after a 15-14 overtime loss to the University of Pennsylvania in the opening round of the NCAA Tournament Friday at Stony Brook. O’Donnell posted five goals in the contest, including a free-position strike with 22.6 seconds left at the end of regulation to force OT. Her 61 goals in 2018 lead all midfielders in the nation, ranking her in the top 35 nationally among goal scorers. The senior also led the team with 16 multi-goal games this season including a team-best 14 games with three or more tallies. The Tewaaraton Award nominee, named to the All Big-Ten team for the third consecutive year, is the fourth Penn State player ever to reach the 200 goal milestone with her performance against Penn in the Nittany Lions’ seventh straight NCAA tournament appearance. O’Donnell’s 203 career goals rank sixth in the nation among active players.